I love politics, and I have a sense of humor, but comedic takes on politics usually leave me cold. If there’s an exception, it’s the work of the Scottish director Armando Ianucci. His 2007 film In the Loop, while full of absurdity, captured the spirit of decision-making leading up to the Iraq War, in both the U.S. and the U.K., as effectively as any journalistic account. His British TV series, The Thick of It (now playing on BBC America), focused on a fictional Ministry and its staff, which remained mostly unchanged while cabinet ministers shuffled in and out, waiting to be eviscerated by Malcolm Tucker, the exquisitely foul-mouthed enforcer for an unseen prime minister. Iannucci’s new American series, Veep, with Julia Louis-Dreyfuss as a vain but lovable vice president, freely recycles plot points and character types from The Thick of It. But while Veep can be very funny, most critics agree that it lacks the bite of Iannucci’s earlier works. So what’s missing? It’s not that Iannucci doesn’t get American politics—he certainly got the feel of it in In the Loop, in broad caricature anyway, and Veep gets most things right, especially the role and personalities of congressional staff. Several critics have suggested that in the post-Cheney era, an ignored vice president seems implausible. But the majority of VPOTUSes have been more like Louis-Dreyfuss’s Selina Meyer than like Cheney—even Lyndon Johnson, as we are reminded by Robert Caro’s recent volume. Several other critics, notably Tom Carson writing in The American Prospect, have argued that the problem is that (like most political-comedy characters) Meyer’s political loyalties are unknown. There’s no party, no ideology. I work, I eat, I shower, that’s it. Occasionally I take a dump, just as a sort of treat. I mean that really is my treat. I sit there and I think—no, I'm not gonna read the New Statesman, this time is just for me. This is quality time just for me. Is it normal? They should be reading the New Statesman—or for the American characters, The New Republic—and once upon a time they did. But now they are just keeping up with the demands of their more conservative prime ministers or presidents, or of their more hyper-cautious staffers who never really bothered to read the newspapers, much less the smarter journals. In my time working on Capitol Hill, I came across dozens of people, in positions of some influence, of whom I wanted to plead, “Why are you here?” To prevent the boss from taking risks, to make sure that he had the right talking points and wouldn’t go off-message, seemed to have become an end in itself. It’s not a story of lost idealism—it’s idealism so long forgotten that it’s barely visible, and not traded away for money or power, just gone. This is the culture that Iannucci captures brilliantly. With a couple of exceptions, there are no real conservatives in Iannucci’s worlds. (Those exceptions are the neocon assistant secretary of state who masterminds the secret “war committee” in In the Loop, and the Tory shadow secretary of Social Affairs, a harmless fop who had been considered promising back in the Thatcher years.) Mostly these are liberals stumbling over themselves to avoid mistakes. In Veep, the one liberal who has some passion left is a senator named Andrew Doyle, a gadfly in the mode of the late Paul Wellstone or Howard Metzenbaum (a role that really isn’t being filled in the Senate today), who makes it his pet cause to prevent an “oil man” from being appointed to Meyer’s Clean Energy Task Force, a problem to which Meyer’s staff is indifferent. But even Doyle can do no more than rant about bad things and occasionally block an appointment. My boss when I was a hapless staffer, former Senator Bill Bradley, once said of the institution, “You hold power but you can never claim power.” That’s the dilemma of Veep and all of Iannucci’s work. His characters have won—they’ve won elections, been given some formal power, even if it’s just a tie-breaking vote in the Senate. They vaguely want to use that power for some good—clean energy or education. But the actual ability to use or claim power continually eludes them. 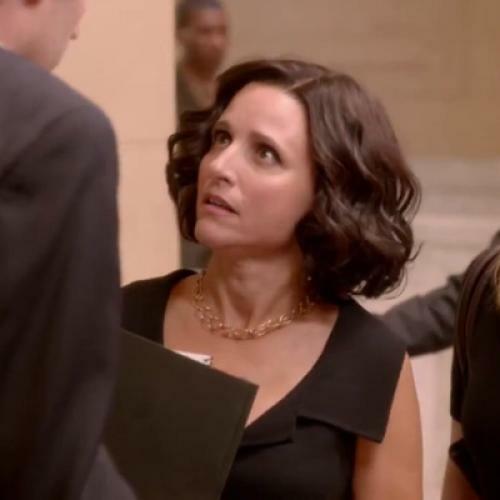 Where Veep falls short, then, is only in Louis-Dreyfuss’s smiling indifference to that fate. The Thick of It ministers were utterly defeated by the effort of trying to run even a small department, avoid getting on the wrong side of Tucker, and getting twisted up in their own blunders. That the staff could carry on while the person who in theory held the power could barely function was part of the humor. In Veep, though, there’s no feeling of tragedy or pathos. As in Seinfeld, life is an endless stream of annoyances and embarrassments, but you move on. Without painfully feeling the futility of sensible liberalism, there isn’t quite enough comedy. The show will be better when Selina Meyer stops smiling—and there’s a lesson there for liberalism in the real world as well.